In January 2012, the Antique Pattern Library posted scans of a quartet of old booklets from the Cartier-Bresson thread company, each showing woodcuts of crochet motifs – large squares and broad border patterns – but without any instructions. I decided to have a go at working out the instructions for one of the squares. The booklets can be found here: Cartier Bresson Coton au Crochet, and the drawing I have been working on is this one: Sheet 2, Pattern B.
Firstly, I am left-handed so the photos shows the stitches worked left-to-right. The design is symmetrical, so it doesn’t matter which way you stitch it, but right-handed crocheters will find their stitches lean in the other directions to the stitches in the photos. Don’t worry about that! Secondly, the terms used in the instructions are British crochet terms. American equivalents are given in the Abbreviations. 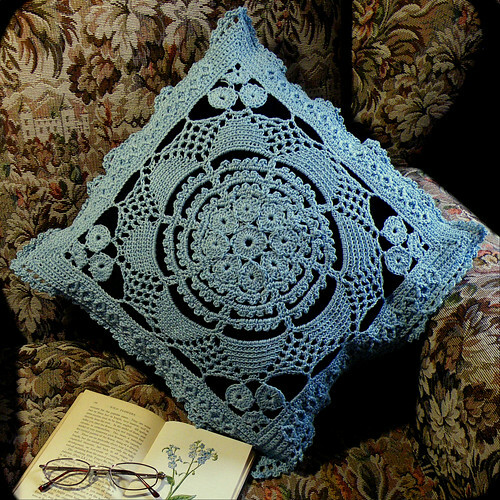 A British ‘double crochet’ is an American ‘single crochet,’ a British ‘treble’ is an American ‘double’, and so on. You do need to worry about this – if you use the wrong stitches, the pattern won’t work. I hope the pattern is clear enough – this is a complex design with a lot of variety. I’ve divided into five sections, so it won’t seem too daunting. I’ve done my best to explain the stitches, but it is not suitable for inexperienced crocheters. If you spot any mistakes, or want to make corrections or suggestions for improvements, please comment. Also let me know if it works – I’ll be very relieved when someone else manages to follow it! PLEASE NOTE British crochet terms have been used. I worked this with 100g of 4-ply knitting cotton (Wendy Supreme Luxury Cotton 4-ply) using a 3.00mm hook. 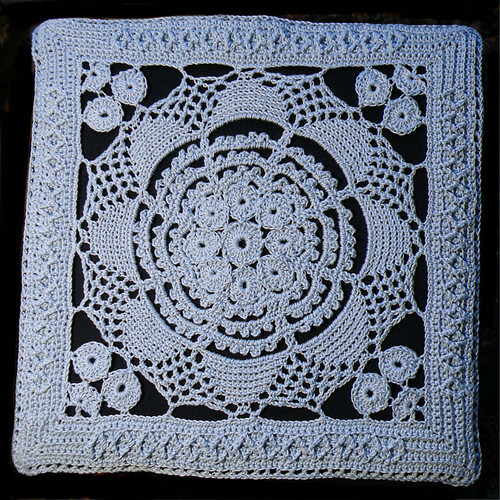 The finished size was approximately 38 cm square (15 inches), suitable for a cushion front. ch = chain stitch, ss = slip stitch, dc = double crochet (American: single crochet), tr = treble (1 yarn over to start. American: double crochet), dt = double treble (2 yarn overs to start. American: treble crochet. ), tbl = through back loop (pick up only the back part of the top of the stitch below) st = stitch, prev = previous. First Section: there is a Centre Circle of 24 stitches surrounded by 8 Outer Circles of 16 stitches. All the circles are started separately, the Outer Circles are joined with slip stitches to every third stitch of the Centre Circle and also to each other as the work progresses. Make 6 ch, join to a ring with a ss into 1st ch. 2 ch (counts as first st), 23 tr into ring, join to 2nd of 2 ch with a ss, fasten off. Make 4 ch, join to a ring with a ss into 1st ch. 2 ch (counts as first st), 7 tr into ring, join to 1st stitch of Centre Circle with a ss, 8 tr, join to 2nd of 2 ch with a ss, fasten off. Make ring as for First Outer Circle. 2 ch (counts as first st), 7 tr into ring, join with a ss to the 3rd st of Centre Circle counting from previous join. 3 tr into ring, join to 5th st of prev Outer Circle with a ss, 5 tr into ring, join to 2nd of 2 ch with a ss, fasten off. Make ring as for First Outer Circle. 2 ch (counts as first st), 4 tr into ring, join to 11th stitch of First Outer Circle with a ss, 3 tr into ring, join to 22nd stitch of Centre Circle with a ss, 3 tr into ring, join to 5th st of Seventh Outer Circle with a ss, 5 tr into ring, join with a ss. Do not fasten off the thread. Second Section: Straight bars separated by arches. The arches are made from chain loops filled with pairs of double crochet stitches separated by 3 chain picots. All rounds are worked from the front. Start with 2 ch, 1 dc into 1st stitch of Eight Outer Circle, 3ch, 1 dc into 4th stitch of Outer Circle, now work into stitches of First Outer Circle: 1 dc into 13th stitch, 3 ch, 1 dc into 16th stitch, 1 dc into 1st stitch, 3 ch, 1 dc into 4th stitch. Repeat for the Second to Seventh Outer Circles. Work 1 dc into the 13th st of the Eighth Outer Circle, 3ch, join to 1st of 2 starting ch with a ss. Start with 2 ch, 1 dc into 1st dc of Round 1. For the picot arch: into first 3 ch loop work 2 dc, 3 ch, 1 dc; 1 dc into next dc, 3 ch, 1 dc into next dc; into the next 3 ch loop work 1 dc, 3 ch, 2 dc. For the bar: work 1 dc into each of next 2 dc. 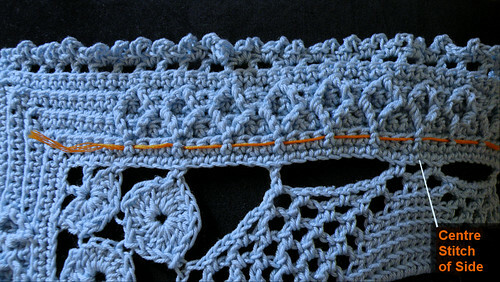 Work picot arch and bar 6 more times, work 8th picot arch, join to 2nd ch with a ss. Start with 2ch, 1tr into next dc, *10 ch, 1 tr in each of the 2 bar stitches. * Repeat from * to * 6 more times. 10ch, join to first ch with a ss. Start with 2 ch, 1 dc into next dc. For each picot arch, work into 10 ch loop: (2 dc, 3 ch) 4 times, 2 dc. For each bar, work 1 dc into each tr of Round 3. After working 8th picot loop, join to 2nd ch with a ss. Work as Round 3, but make 12 ch in each loop instead of 10 ch. Start with 1 ch, 1 dc into dc. For each picot arch, work into 12 ch loop: (2 dc, 3 ch) 5 times, 2 dc. For each bar, work 1 dc into each tr of Round 5. After working 8th picot loop, join to 2nd ch with a ss. Work as Round 3 but make 14 ch in each loop. Third Section: the arches change to blocks of solid double crochet worked through the back loop, separated by arcades of 3 ch loops. Start with 1 ch. Into each 14 chain loop, work 18 dc, 1ch. join with a ss into 1st ch. Start with 4 ch. Work into each 18 dc block of the prev round: skip 1st dc, 1 dc tbl into each of next 16 dc, skip 18th dc. Between each block of dc work: 2 ch, 1 tr into 1 ch of prev round, 2 ch. After working the 8th dc block, end with: 1 ch, 1 tr into 2nd of 4 starting ch. Start with 4 ch. 1 dc into 2 ch loop, 3 ch. Work into each dc block: as follows: skip 1st dc, 1 dc tbl in each of next 14 dc, skip 16th dc. Between each block: 3 ch, 1 dc into each 2 ch loop, 3 ch. After working the 8th block, end with: 1 ch, 1 tr into 1st of 4 starting ch. Start with 4 ch. 1 dc into 3 ch loop, 3 ch, 1 dc into next 3 ch loop, 3 ch. Work into each dc block: skip 1st dc, 1 dc tbl in each of next 12 dc, skip 14th dc. Between each block: make 3 ch, then work 1 dc 3 ch into each 3 ch loop. After working the 8th dc block, end with: 1 ch, 1 tr into 1st of 4 starting ch. Start with 4 ch. Work 1 dc, 3 ch into each 3 ch loop. Work into each dc block: skip 1st dc, 1 dc tbl in each of next 10 dc, skip 12th dc. Between each block of dc: make 3 ch, then work 1 dc, 3 ch into each 3 ch loop. After working the 8th dc block, end with: 1 ch, 1 tr into 1st of 4 starting ch. Start with 4 ch. Work 1 dc, 3 ch into each 3 ch loop. Work into each dc block: skip 1st and 2nd dc, 1 dc tbl in each of next 6 dc, skip 9th and 10th dc. Between each block of dc: make 3 ch, then work 1 dc, 3 ch into each 3 ch loop. After working the 8th dc block, end with: 1 ch, 1 tr into 1st of 4 starting ch. Start with 4 ch. Work 1 dc, 3 ch into each 3 ch loop. Work into each dc block: skip 1st and 2nd dc, 1 dc tbl in each of next 2 dc, skip 5th and 6th dc. Between each block of dc: make 3 ch, then work 1 dc, 3 ch into each 3 ch loop. After working the 8th dc block, make 3 ch and join to 1st of 4 starting ch with a ss. Fasten off. Fourth Section: corner fillings and connections. 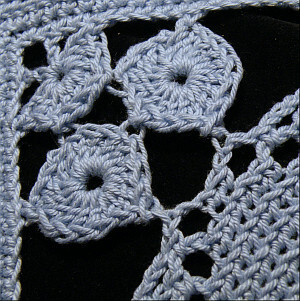 Each of the four corner pieces are made from 2 small 18-stitch circles and 1 9-stitch half-circle – the pieces are joined to each other and to the completed motif with slip stitches during the working. Then a pick-up round is worked to form the basis for the square outer border. The pick-up round uses various stitches to connect to the completed motifs, with chain between them. Make 4 ch, join into a ring with a ss. 2 ch (counts as first stitch), 8 tr into ring, join to the main motif with a ss into the 2nd ch of the first 3 ch loop after the 2 dc tbl of a block. (See the photo.) 9 tr into ring, joint to 2nd of 2 ch with a ss, fasten off. Make 4 ch, join into a ring with a ss. 2 ch (counts as first stitch), 5 tr into ring, join to 13th st of First Circle with a ss, 4 tr into ring, join to the main motif with a ss into the 2nd ch of the last 3 ch loop before the same 2 dc tbl. (See the photo.) 9 tr into ring, joint to 2nd of 2 ch with a ss, fasten off. Make 4 ch, join into a ring with a ss. 2 ch (counts as first stitch), 2 tr into ring, join to 16th st of First Circle with a ss, 3 tr into ring, join 2nd st of Second Circle with a ss, 3 tr into ring, fasten off. Make 3 more of these corners, joining them to the loops adjacent to every other dc block. This is complex, so please refer to the photo if you are not sure where to place the joining stitches. Start at any corner. * Make 2 ch, 1 tr into the ring of Half Circle, 2 ch, 1 dc into tip of Half Circle, 4 ch, 1 dc into 3rd st of First Circle, 6 ch, 1 tr into the central 3ch loop between blocks of main motif, 10 ch, 1 dc into last 3 ch loop before block, 3 ch, 1 dc into next 3 ch loop, 10 ch, 3 ch, dc into 15th st of Second Circle of next corner, 4 ch, 1 dc into tip of half Circle, 2 ch, 1 tr into ring of Half Circle, 2 ch. * This completes one side of the square, which should be 61 stitches in total. Repeat from * to * 3 more times, join to 1st ch with a ss. Fifth Section: The square outer border. This is worked in rounds, turning the work at the end of every round, increasing at the four corners to give a square shape. The even-numbered rows are worked in double crochet. Odd numbered rows are mostly double crochet worked through the back loop, but in the 5th and 7th rounds there are also double-trebles in relief used for the thirteen diamond-shaped motifs on each side. The final round is a mesh made of trebles separated by one chain. Worked from the right side of work. Start with 2 ch (counts as first dc), 1 dc tbl in next 60 sts of pick-up round. 2 ch for corner, 61 dc tbl, 2 ch, 61 dc tbl, 2 ch, 61 dc tbl, 2 ch, join to 2nd of 2 starting ch. Start with 2 ch and turn work to wrong side. * Work corner increase: 1 dc into 1st of 2 ch, 2 ch, 1 dc into 2nd of 2 ch. Work side: 1 dc into each of next 61 dc. * repeat from * to * for 2nd and 3rd sides, work corner increase. Fourth side: work 60 dc, join to 2nd of 2 starting ch with a ss. Worked from the right side of work. Start with 2 ch, 1 dc tbl in next 61 dc. Work corner increase: 1 dc into 1st of 2 ch, 2 ch, 1 dc into 2nd of 2 ch. Work side: 1 dc tbl into each of next 63 dc. * repeat from * to * for 3rd and 4th sides, work corner increase. 1 dc tbl in next dc, join to 2nd of 2 starting ch with a ss. Start with 2 ch and turn work to wrong side. 1 dc in each of next 2 dc. * Work corner increase: 1 dc into 1st of 2 ch, 2 ch, 1 dc into 2nd of 2 ch. Work side: 1 dc into each of next 65 dc. * repeat from * to * for 2nd and 3rd sides, work corner increase. Fourth side: work 62 dc, join to 2nd of 2 starting ch with a ss. Before you start this round, take some contrasting thread and mark the centre stitch in Round 2, and every 4th st to the left and right of it until you have marked 6 on each side, plus the centre st = 13 marked stitches in total. (See photo.) This will make positioning the relief stitches much easier. Worked from the right side of work. Start with 2 ch, 1 dc tbl in next 4 dc. Work a surface double treble: make a dt into the front loop at the top of the first marked stitch in Round 2 (this was the loop not picked up when working tbl in Round 3). skip the next dc in Round 4, work 1 dc tbl in each of the next 3 dc. Work 2 surface double treble together: yarn over hook twice, insert hook into the same loop as previous dt, yarn over hook and pull through 2 loops, yarn over hook again and pull through two loops, leaving 2 loops on hook. Yarn over hook twice and insert hook into the front loop at the top of the next marked stitch. Yarn over hook and pull through 2 loops, yarn over hook again and pull through two loops, yarn over hook again, and pull through all three loops on hook. Skip the next dc in Round 4, work 3 dc tbl into next 3 dc. Continue to work 2 surface dt together, skip 1 dc and work 3 dc tbl until the loop at the top of the 13th marked stitch. The 2nd dt into this loop is worked normally. Skip the next dc of Round 4, work 1 dc tbl into each stitch to corner. Increase into corner, as before. The 2nd to 4t sides are worked in the same way, but there are 8 dc tbl into the dc of Round 4 before the first dt. After working 4th increase into corner, continue in dc tbl to end of round, join to 2nd of starting ch with a ss. (This one is easy!) Start with 2 ch and turn work to wrong side. Work dc into every stitch of previous round, increasing into corners as before. (The 2 surface dt together count as one st). After working 4th increase into corner, continue in dc to end of round, join to 2nd ch of 2 starting ch with a ss. Worked from right side. Start with 2 ch. Work 1 dc tbl into each of next 6 dc. Work 2 surface dt together, putting the hook into the top of the stem of the dt before and the dt after the marked stitch,. to complete the diamond shape. Skip next dc in Round 6, work 1 dc tbl in each of the next 3 dc. Continue working in pattern to complete all 13 diamonds, skip next dc in round 6, work 1 dc tbl in each of next 12 dc to corner. Increase into corner as before. Work 2nd, 3rd and 4th sides and corners in the same way. After working 4th increase into corner, continue in dc tbl to end of round, join to 2nd of 2 starting ch with a ss. Worked from wrong side. Work as Round 6. Worked from right side. 3 ch, skip next dc, work 1 tr tbl, 1 ch into next and every other stitch to corner. Into each corner 2 ch loop, work (1 tr, 1 ch) 3 times. Continue to end of round, working all tr tbl except for the 3 into each corner loop. Join to 2nd of 3 starting ch with a ss. Worked from right side. Start with 2 ch, work 1 dc into 1st ch space of Round 9, 3 ch, *2 dc into next ch space, 3 ch* repeat from * to * all around square, ending with a ss into 2nd of 2 starting ch. Finish off. The final round is the round of applause you give yourself for managing to follow these instructions! Fabulous! You are a marvel! It’s an unusual square, certainly.